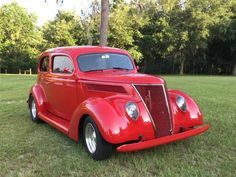 There\'s a simple reason they painted this 1935 Ford Sedan a standout color: it\'s a standout custom. With cool style (including great pinstriping), A/C comfort, and rumbling V8 power, it provides a great total package. Under the hood is a reliable Chevy 350 cubic-inch V8 that has been built both for show and go. Not only do you have a color-matched engine bay, but also there\'s a great shine on the air topper, matching valve coves, alternator, and much more. And there\'s plenty of power thanks to an Edelbrock four-barrel carburetor, Weiand intake, and headers feeding the dual exhaust. 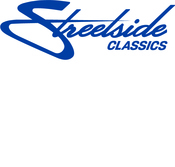 Because you\'ll want to show this coupe off everywhere, it was built with great driving features like a TH350 three-speed automatic transmission, power steering, a Mustang II-style independent front suspension, and front disc brakes. 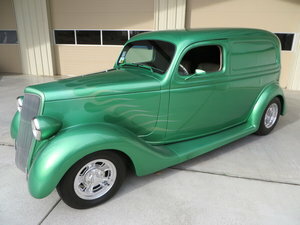 Cool, classic, and absolutely memorable, the hard work has already been put into this \'35 Ford. All you need to do is get down here and turn the key. Call today!! !